At the top of your screen is the Menu and Hint button. Across the bottom is your inventory purse, task list, trinket box, and diary. 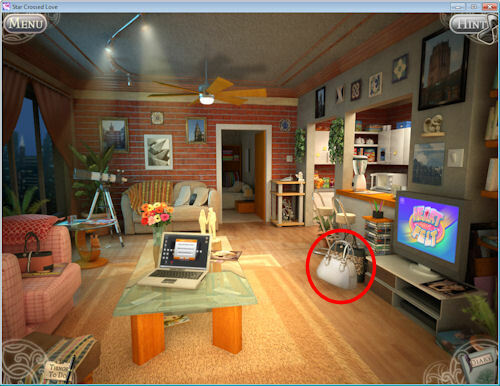 To use an item in your inventory, move the mouse over the purse and a fly-out screen will show up. 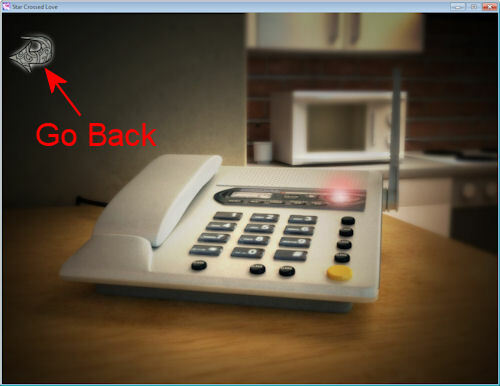 Left-click on an item, then let up on the mouse, move it to where it needs to be used, and left-click to place or use it. 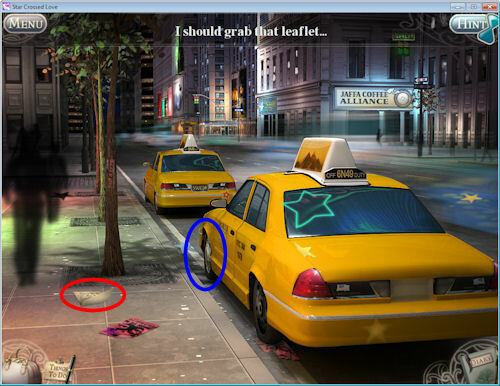 The Hint button will fill up over time but only if there are things to be done or items found in the current scene. If the button doesn’t fill up, then there isn’t anything it can help you with. 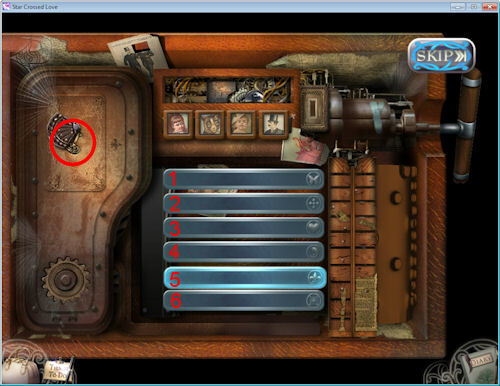 When zoomed into an item or in a mini-game screen, you’ll have a go back arrow on the top left-hand corner and, for mini-games, a skip button in the top right-hand corner. When new tasks become available, you can find them by clicking on the “Things To Do” icon. You may have one or more tasks available. 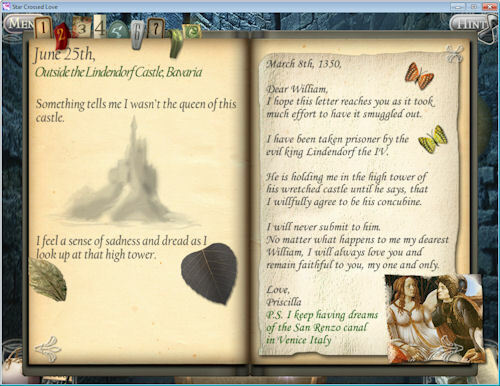 Click on the diary to read your notes and any items that you find that are added to it. 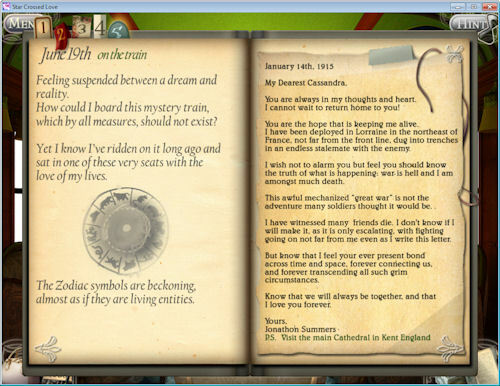 When you find a time capsule and select the enclosed note, the diary will automatically open so you can read it. You start out in the subway and end up at your apartment, which is dark. Click on the lightswitch to turn on the lights. You’ll see a flashing light on the switch to help you locate it. Once the light is on, click on your laptop to check your e-mail. 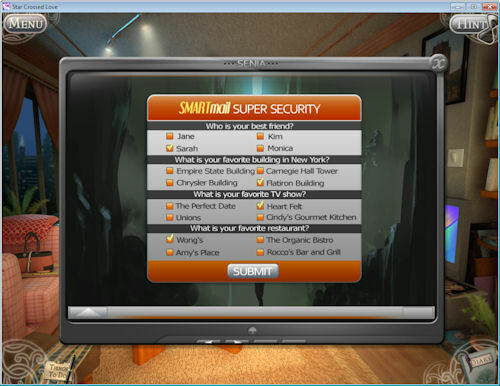 Click on the e-mail icon, and you’ll get a security screen. You’ll need to find the answers to these questions around your apartment. 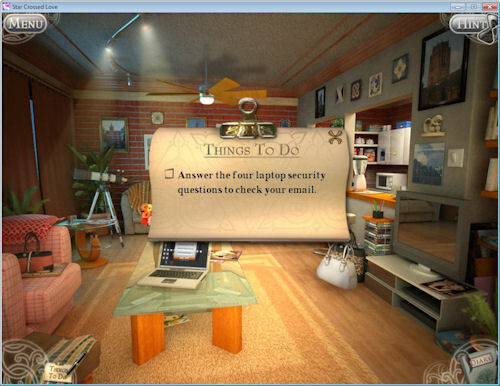 First, you’ll need to collect your diary and task list (items 1 and 2 above). Click on your diary (1), in front of the TV. It will automatically open to the first entry and once you close it, it will be available in the bottom right corner of your screen. Click on your task list (2), to the right of your laptop. 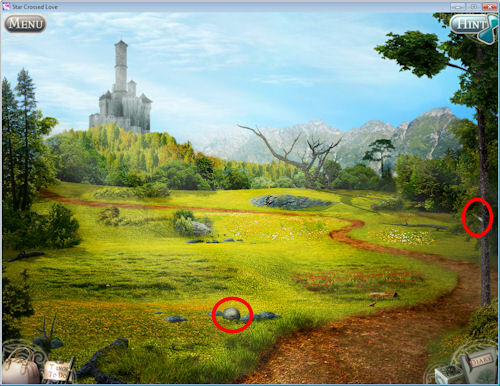 It will open with your first task and once you close it, it will be available in the bottom left corner of your screen. 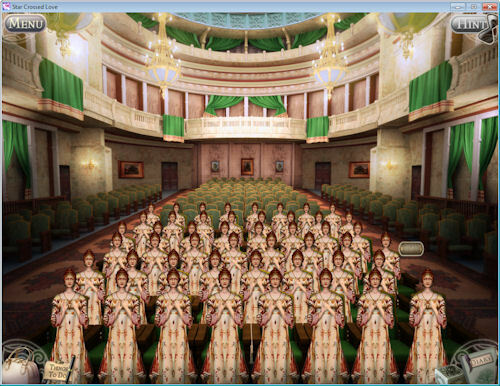 Click on the phone in the center back of the room (3). Click on the flashing button to listen to a message from your best friend, Sarah. If you want to, open your diary to see that this has been added to the notes there. 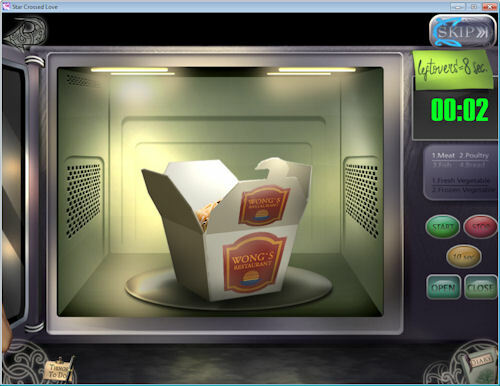 Click on the microwave in the kitchen (4). The door will open. Click on it again to zoom in. Click on the Close button. Note that leftovers need 8 seconds to heat up. 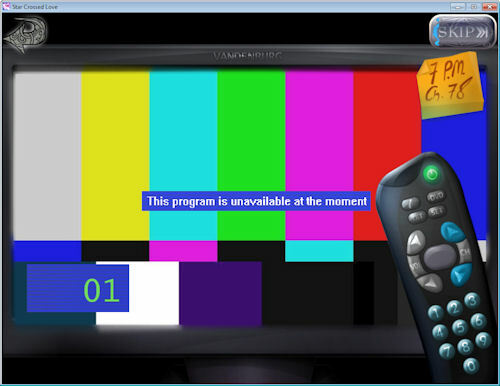 Click on the yellow 10 sec button (1) to set the timer. Click on the green Start button (2). You’ll need to watch the time closely and click on the red Stop button once it hits 2 seconds. If you miss it, click on the yellow button again, start it, then stop it at the 2 second mark. 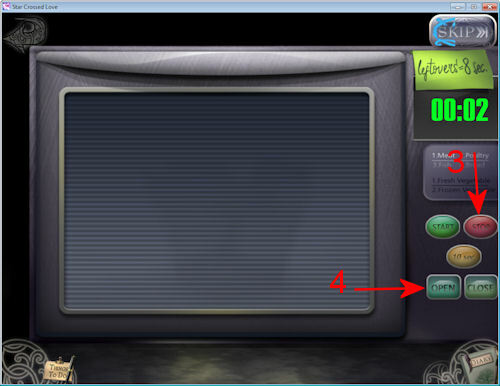 Once the timer reaches 2 seconds, quickly hit the red Stop button (3) then the Open button (4). If you did it correctly, you’ll see the label on the side of the container showing your favorite restaurant. We now have the answer to two of our four security questions. 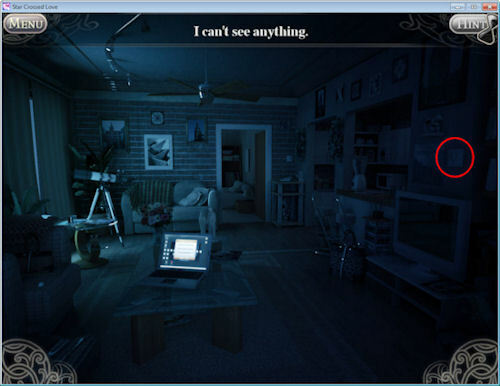 Click on the curtain on the far left of the room, then again on it in the close up. You’ll see a view of the city from your window. At the bottom is a listing of what you need to find and how many of them. At the bottom right corner is the telescope. Click on the telescope to zoom in on the view. 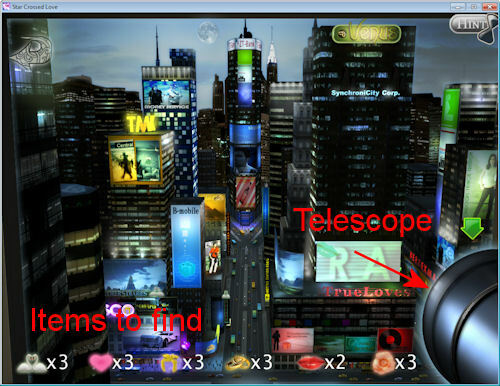 Once you zoom in, move around the screen and click on each item as you find it. The lips on the RA billboard and on the bus may not be visible at first, just wait until the image on the billboard changes and the bus comes into view. 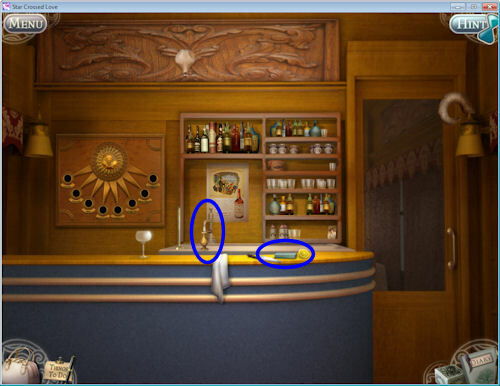 The two items circled in blue were on the first screen but are there if you missed them. 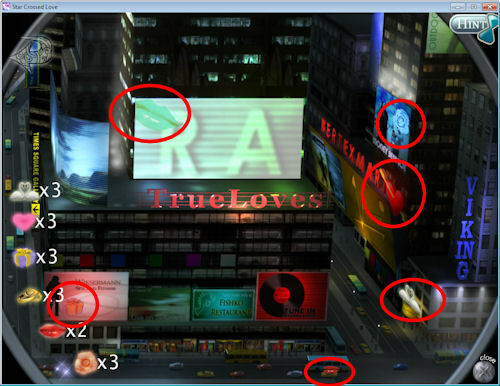 Once you find all the items you’ll remember that your favorite building is the Flatiron building. 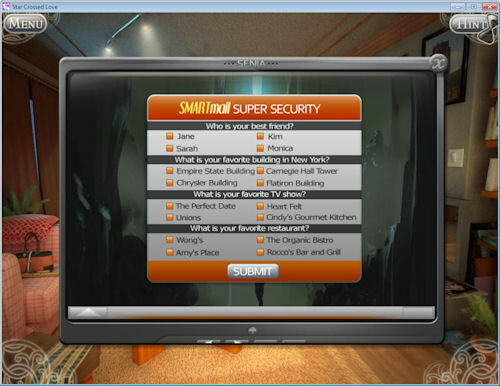 For our final security question, we’ll need to turn on the TV. Click on the pillow on the couch in the back to reveal the remote control. Click on it then drag it over to the TV. 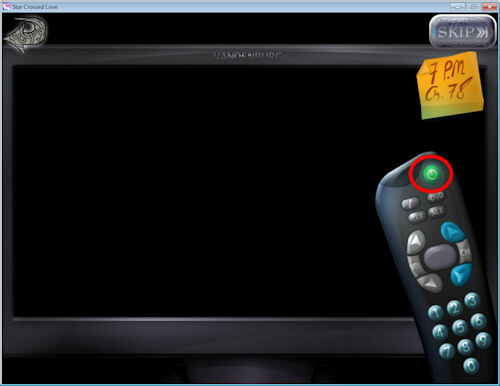 Click on the power button to turn on the TV. Enter 78 on the remote as noted on the sticky. Your favorite show, Heart Felt, will come up. Don’t try to turn off the TV or you’ll complain! If you check your diary now, you’ll see that the answers to the four security questions have been entered. Close the diary and click on your laptop again. Select the answers to the questions as shown below, then click on Submit. 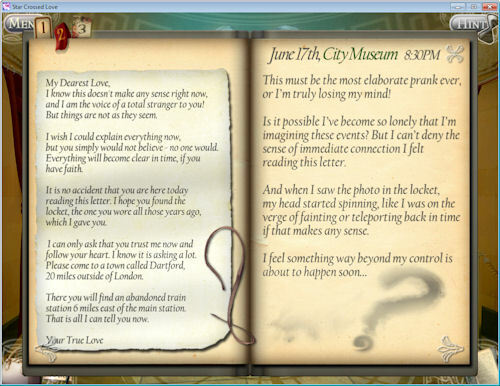 A letter will come up asking you to meet someone at the museum at 8 pm and that they know why you can’t fall in love. Close out the e-mail and grab your purse. It will be available in the bottom left corner as your inventory. You’ll now find yourself on the street and needing to find a taxi. 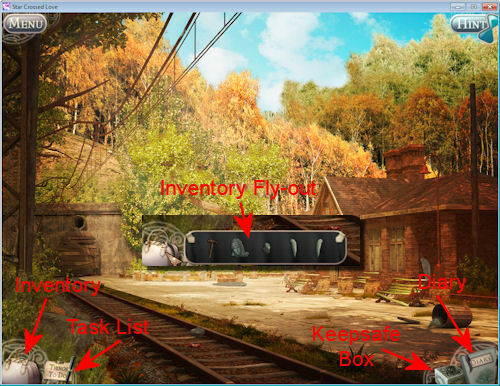 Here, the game will explain about picking up items to add to your inventory and using them. 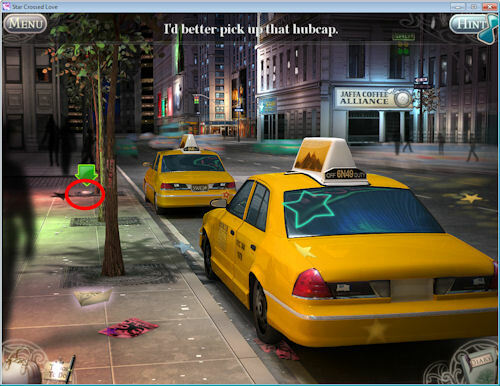 Pick up the hubcap shown by the green arrow. It will go into your inventory. 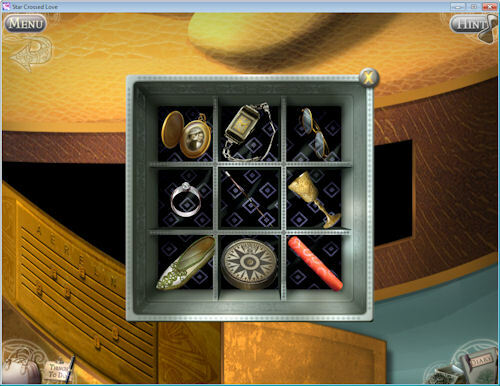 Hover the cursor over the purse then select the hubcap from the inventory fly-out. Let up on the mouse and move over to the front tire, then left-click to place it on the tire. 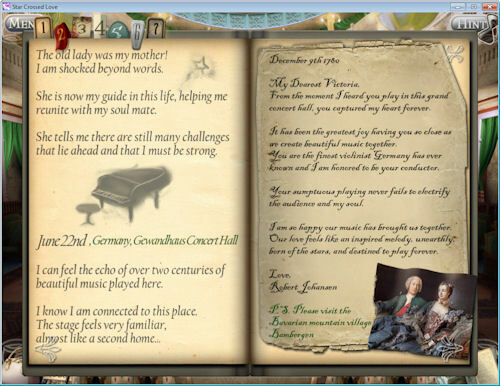 Next, click on the leaflet marked in red to pick it up. 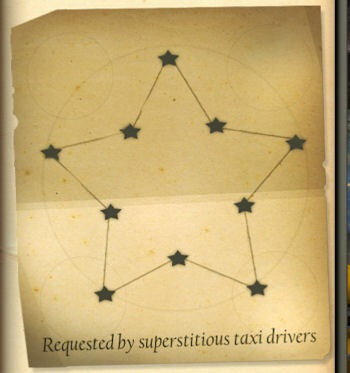 The leaflet is a star that you’ll need to make the taxi driver comfortable enough to give you a ride. Click on the taxi and you’ll be told that the driver won’t go until the stars are aligned and his missing hubcaps and license plate are found. Find the second hubcap (in red) and place it on the rear wheel. Find the license plate (in blue) and place it on the back of the car. The driver still won’t let you in until the stars are aligned. 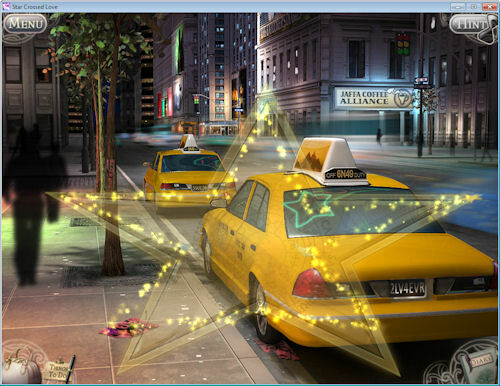 Locate all the stars in the scene (in red) and click on each one in the shape of a star. It doesn’t matter which one you start with, but you do have to select the correct star in the right shape. Use the diagram below for one solution. Once all the stars are aligned, the driver will open the door. Click on the door and you’ll be driven to the museum. 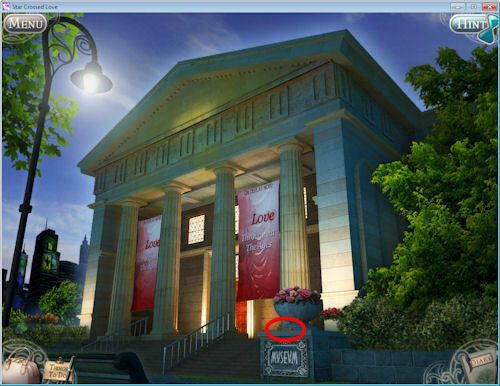 At the museum, pick up the key below the roses then enter the building. 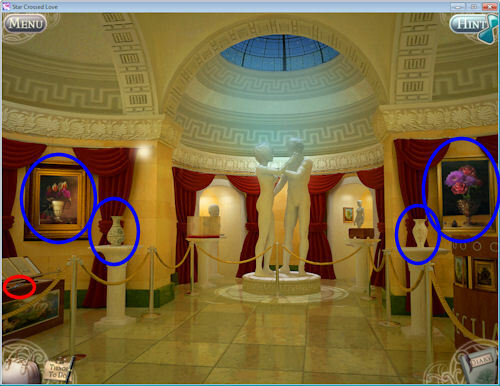 Once in the building, click on the statues to find out that they are roped off until the exhibit is complete. 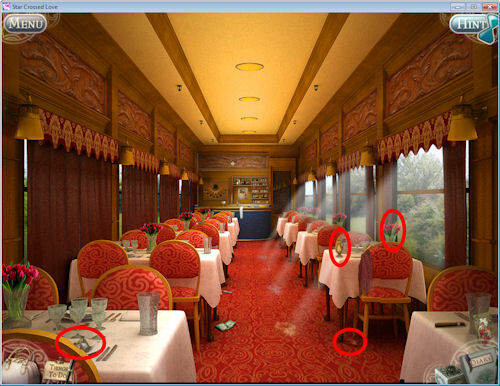 Click on the paintings of the flowers to find out what flowers are needed. Clicking on the vases will tell you that these are great places for flowers. Pick up the scissors on the book stand (in red). Go back outside and select the scissors from your inventory. Click once on each flower section (in blue) and twice on the bush (in red), once to cut the bush and once to cut the flowers that are behind it. Go back inside and place a begonia and a tulip in the left vase, and a rose and other flower in the right vase. The ropes will be removed and an old woman will be standing looking at the exhibit. Click on her and exhaust all communication. 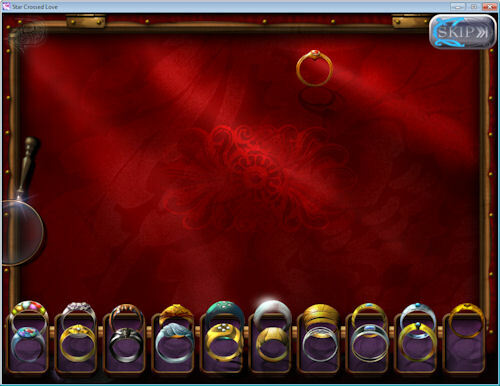 When the woman disappears, select the key from your inventory and click on the ring collection. 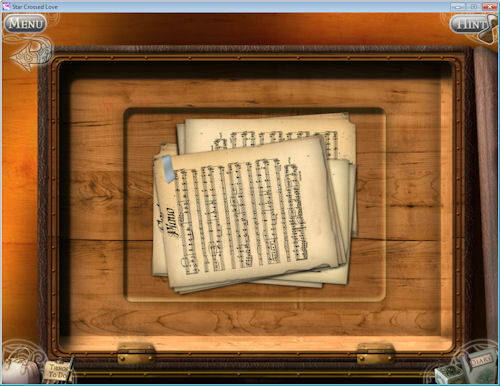 You can click on the music box but it will tell you that it is missing a part. 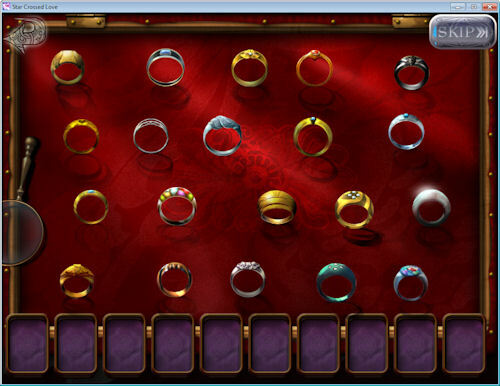 When the ring collection opens, you’ll see a display of rings. 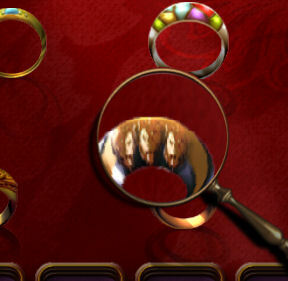 Use the magnifying glass to look over each ring and match them up. Click on the first ring, then the matching ring. Continue until all rings are matched up. Once all the rings are matched up, grab the gear that fell from the box. Click on the music box. 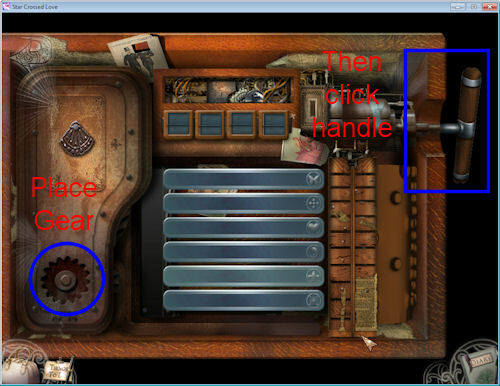 Place the gear in the music box, then click on the handle. A tune will play and you’ll need to replay the tune four times to win. As each round is completed, the four squares above the tines are opened up. Number the tines one to six and follow the sequence below to finish the tune. After each round, click on the handle to get the next set of tones. 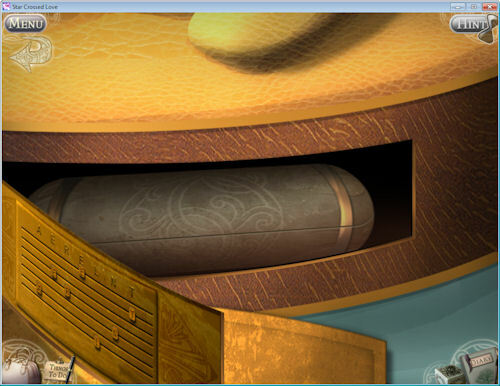 Once you’ve won, grab the key that is revealed at the top left of the music box. 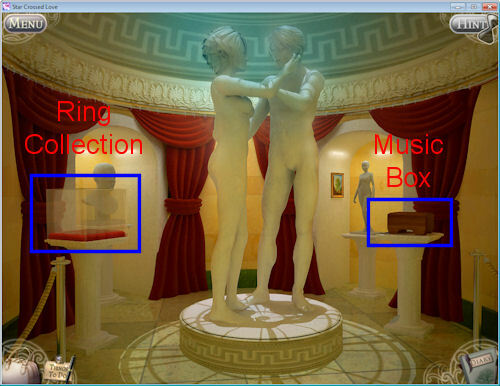 Back at the statues, use the key on the keepsafe box behind the music box pillar. 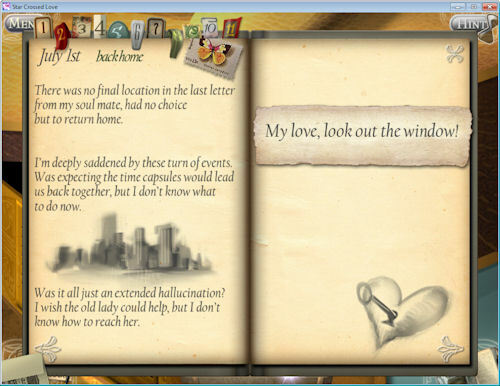 The box contains a locket and will be added to your icon bar to the left of the diary. Click on the letter. The letter will be added to your diary and will give you part of your story. It will also tell you where to go next. Your next location is a rundown train station in Dartford, England. 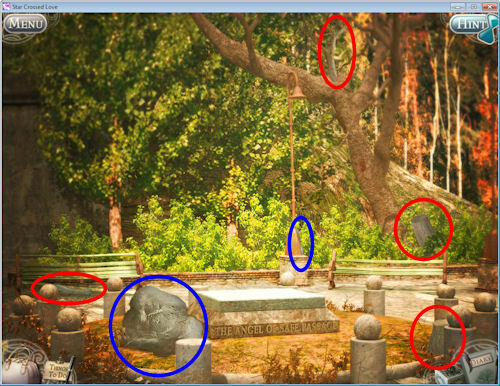 Collect the hammer (in blue) and the statue pieces (in red). 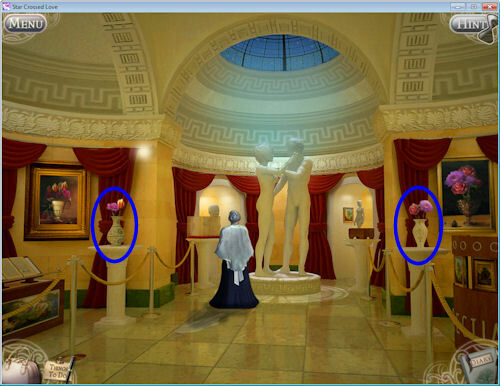 Once you have the pieces, click on the back of the scene, in front of the tree to go to the statue base. At the statue base, collect the statue pieces (in red) and the chisel at the base of the lamp (in blue). 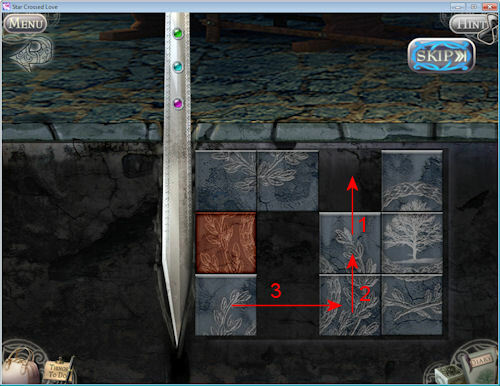 Take your hammer and hit the large stone in the front (in blue). 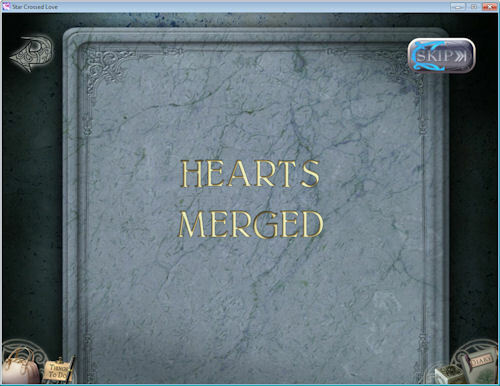 Take the chisel and hit the medium stone that is left over to get the last statue piece. Place the statue pieces in order on the base. 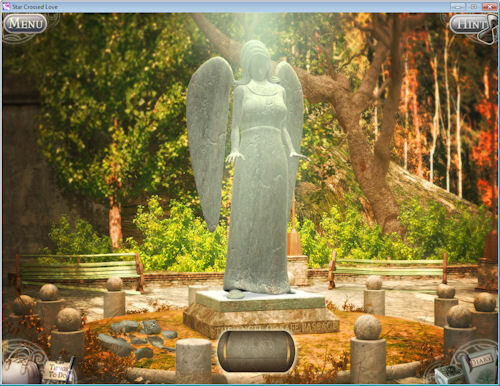 Make sure you click on the statue as you add each piece or you’ll get bonked. 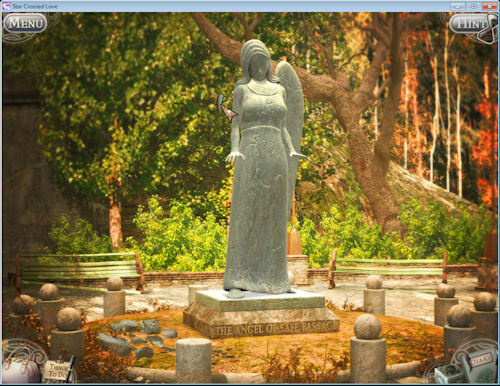 The scene will ripple and a time capsule will drop down in front of the statue. Click on the capsule to open it and take the letter. The letter will be added to your diary with more information and a new location. Back away from the statue and click on the ticket office. 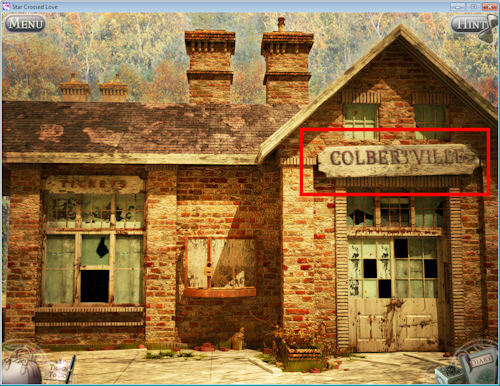 The sign needs to be repaired so collect the letters marked in red. You’ll be brought back in time to when the station was in good shape. A train will come up the tracks. 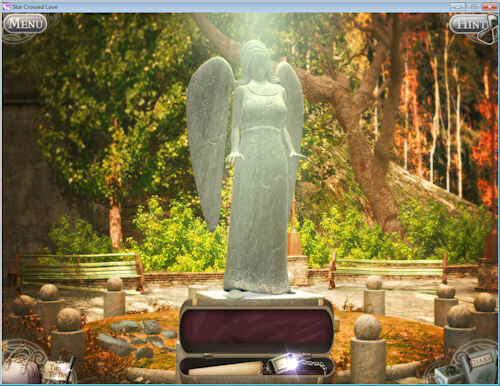 Click on the headlight to collect a silver dollar. You can collect it later but the ticket master won’t sell you a ticket without it so you might as well get it now. Click on the ticket office and hand the ticket master the coin. He’ll tell you that it isn’t enough but if you’ll fix the train schedule, he’ll give you a ticket. Click on the box to open it, then again to zoom in. 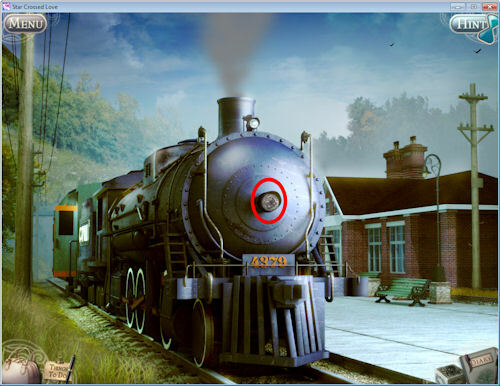 You’ll need to rotate the tracks so that each light on the left has tracks that connect it to the matching colored circle on the right. 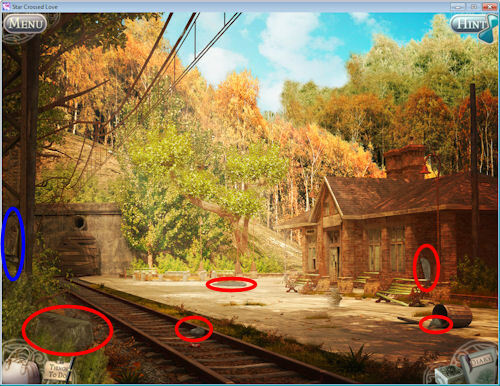 The tracks can lead to multiple locations and you’ll hear a sound and the small lights around the left lights will come on to show you that you’ve connected the tracks for that line. Don’t worry if you have tracks left over. 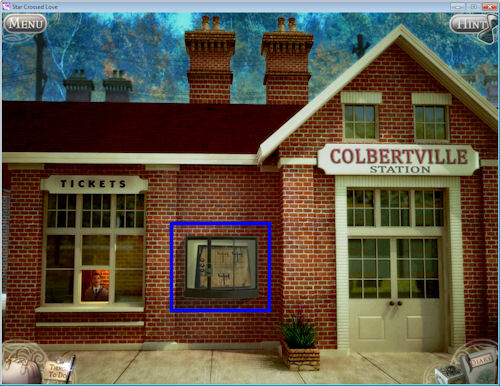 Once the tracks are connected, grab the ticket in front of the ticket window. 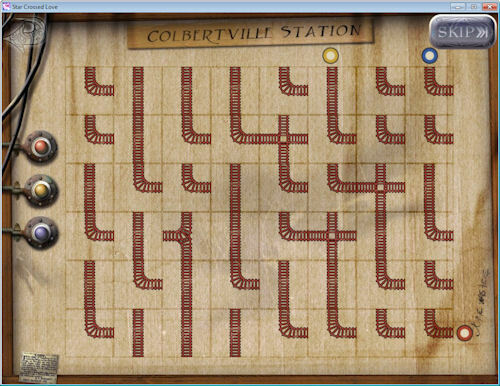 Back up, take the ticket from your inventory and click on the train. You’ll find yourself in a train car with zodiac symbols along each side and a center medallion on the ceiling. 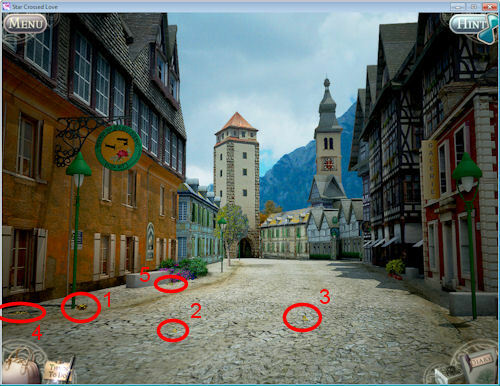 You can click on them but the symbols will be missing items and the medallion will be locked. 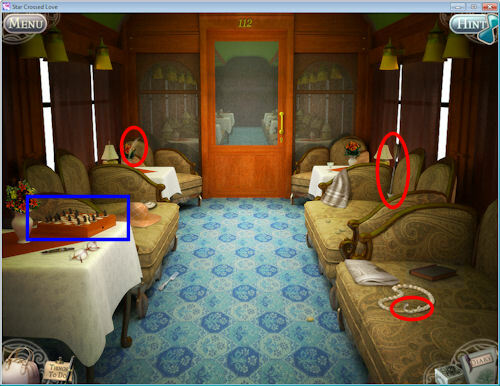 Collect the items circled in red (lion tail, ring, and red fabric). Click on the back of the car to move to the next car. Collect the items circled in red (wheat, arrow, scorpion tail), then click on the chess set. 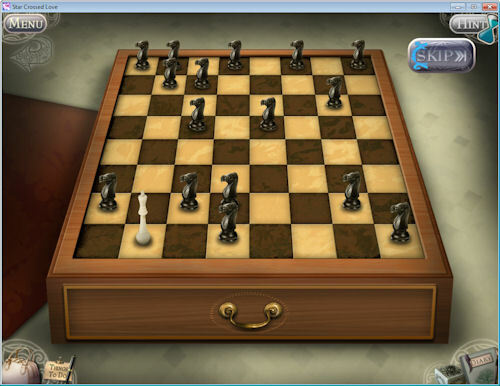 The goal here is to capture the knights without crossing lines. 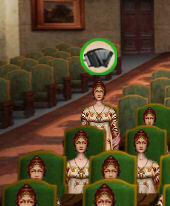 The queen can only move horizontally, vertically, and diagonally from her current location. 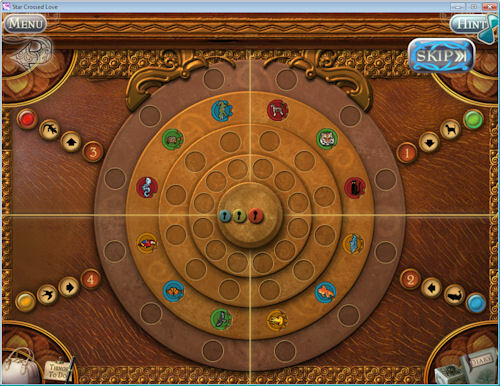 Use the diagram below to complete this mini-game. 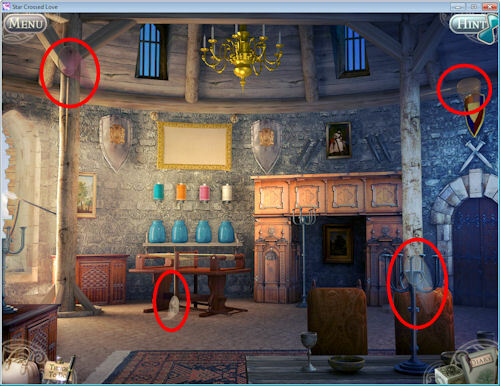 Once you click on the last knight, a drawer will open with the key to the kitchen car. 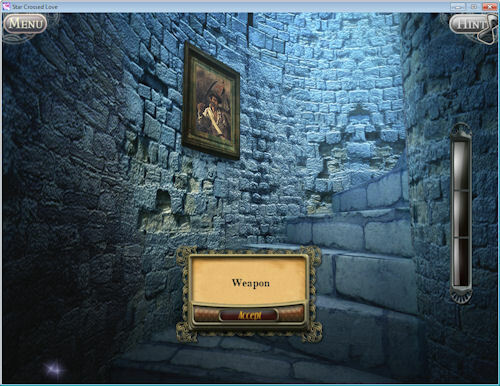 Select the key from inventory and click on the door in the back. 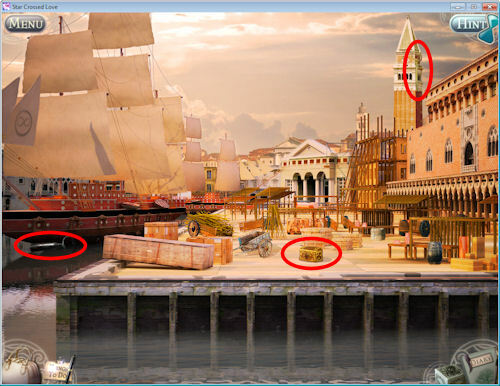 Collect the items circled in red ( fish head, crab claw, wheat, pot). If you run out of room in your inventory, you can skip to the section on fixing the zodiac symbols then come back here when you have room for more items. Click on the kitchen in the back. 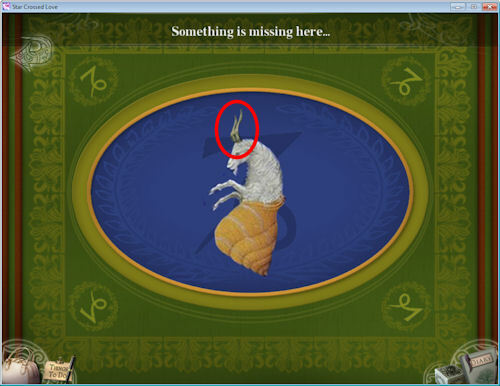 Collect the items marked in red (capricorn horns, ram horn, scales, weight). 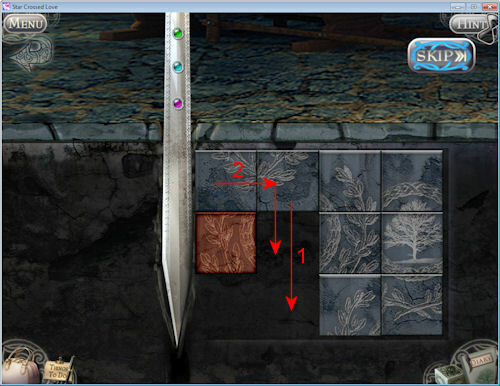 Select the blunt arrow from your inventory and sharpen it on the whetstone on the counter. Select the empty pot from your inventory and place it under the faucet then click on the faucet to turn on the water. Turn off the water and grab the full pot. Back out to the first car and click on the first symbol on the left. For each symbol, you’ll need to add the missing piece. As each symbol is completed, the background will change from red to blue. 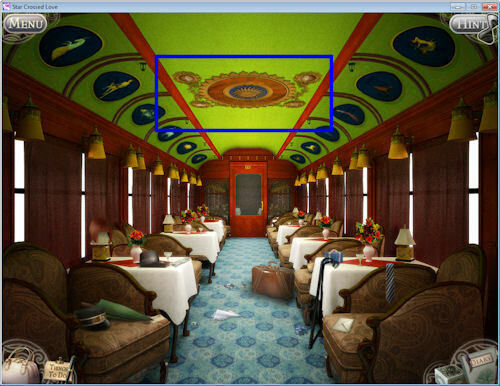 Click on the center medallion. As you repaired the symbols, you kept hearing sounds. These sounds were the world maps opening on each corner of the medallion. Back out of the medallion and move back to the kitchen car. 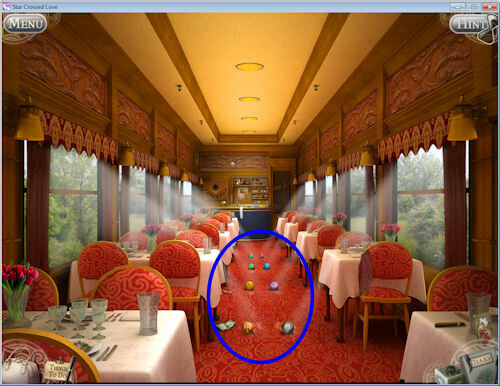 Once all the curtains are opened, eight planet spheres will appear on the floor. 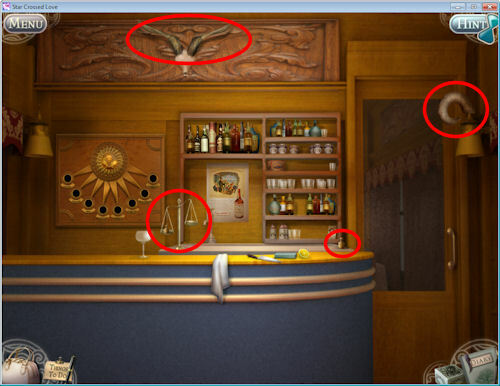 Collect all eight of them then click on the kitchen area and finally on the star panel at the left of the kitchen. 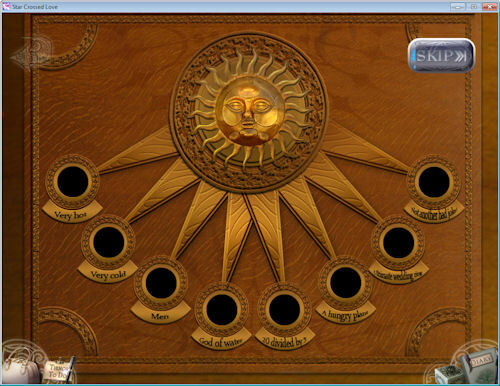 The panel shows a sun medallion and openings for each sphere. 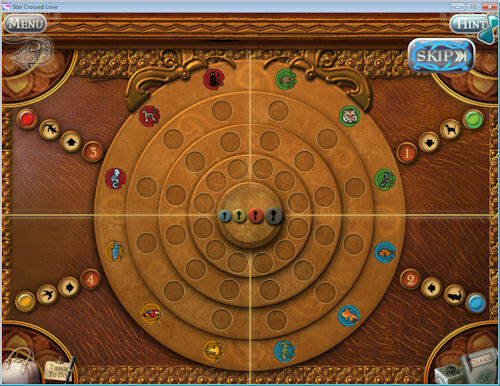 Each opening has a clue under it indicating where each sphere should go. 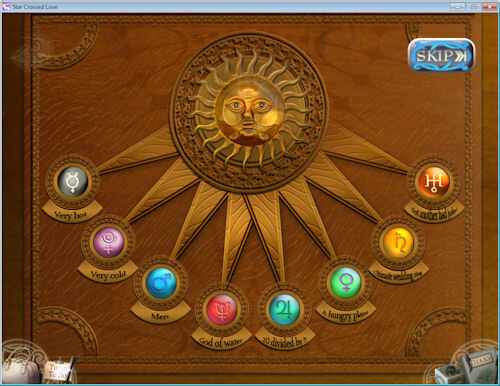 Once the spheres are placed, you can collect the sun medallion. 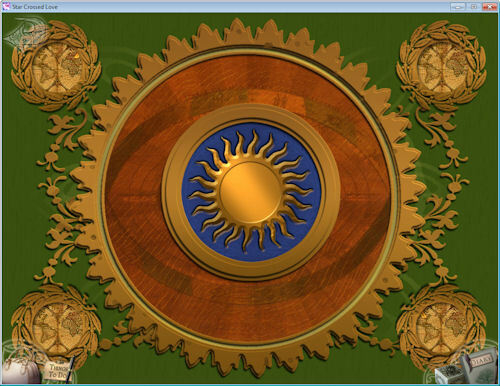 After collecting the sun medallion, return to the first car and click on the ceiling medallion. 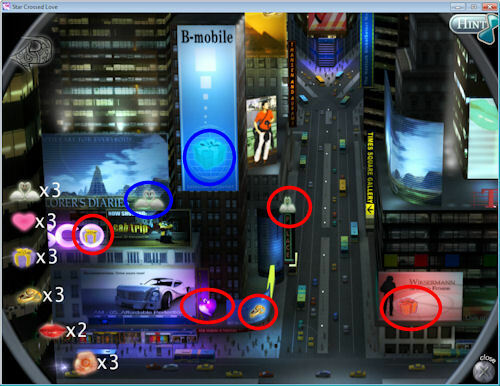 Left-click on each map piece and drag to find the X on each one. Move each X to the center of the opening. Once all four are set, the sun center will be unlocked. Place the sun medallion in the opening. 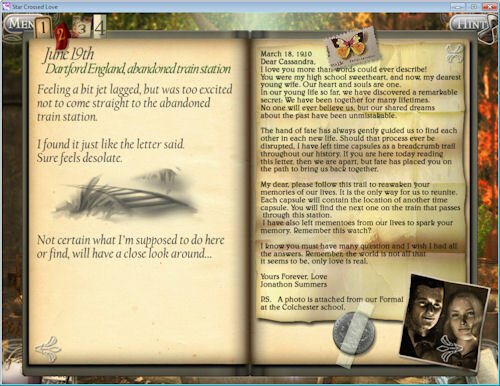 Open the time capsule that appears to get the next letter and destination. You’ll also get a pair of glasses to add to your keepsafe box. When you get to the cathedral, you’ll need to light the candles in order to see anything, or so you say. 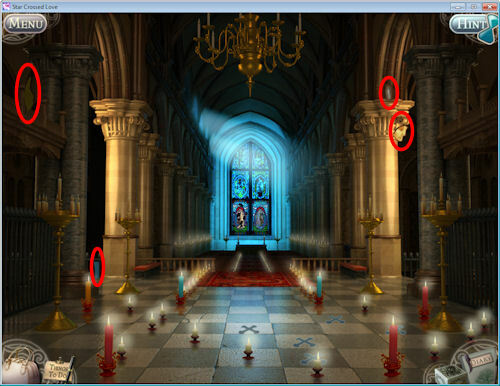 If you play multiple times, you’ll notice that while the large candles stay in the same place, the smaller candles may be in different locations. You need to start with the lit orange candle and place the smaller candles in such a way that they light up nearby candles until all candles are lit. 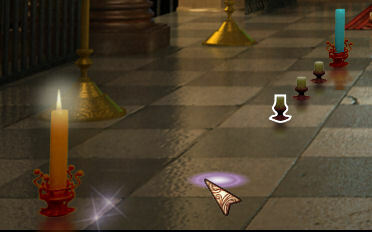 To move a small candle, click on it then drag it to an empty tile. 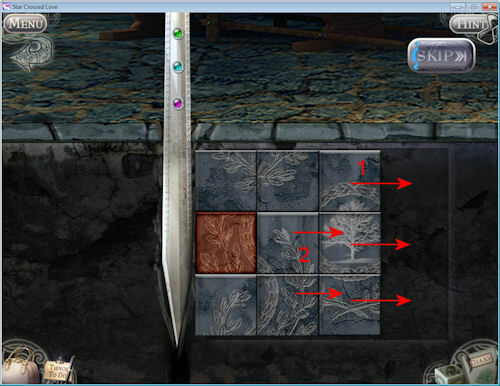 Tiles with an X on them cannot have a candle placed there. 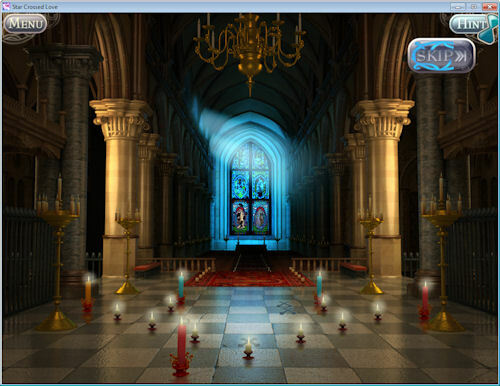 Round 1: Place the small candles as shown below to light all the large candles. 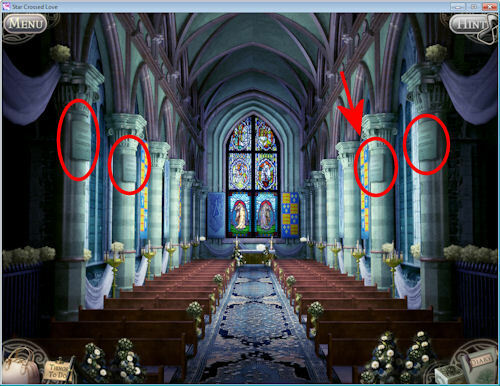 Round 2: Place the small candles as shown below to light all the large candles. Round 3: Place the small candles as shown below to light all the large candles. 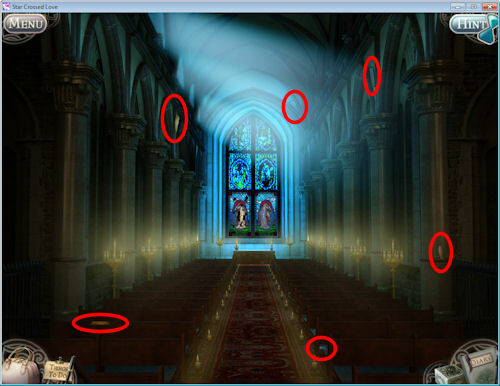 Before leaving the entry, collect the four stained glass pieces marked in red. 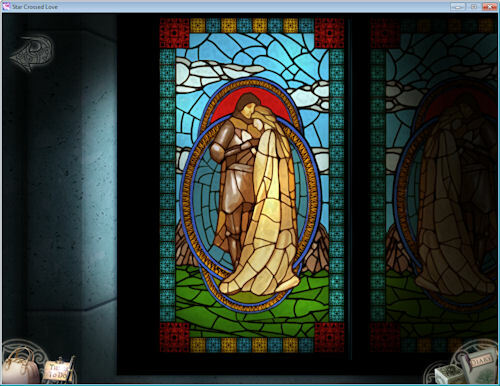 Click on the stained glass window to move further into the building. 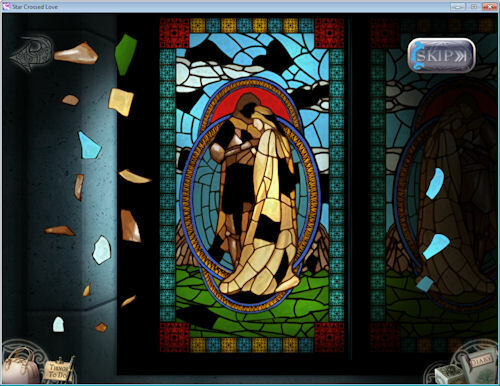 Collect the six stained glass pieces then click on the stained glass window again. Here you’ll find that you need 10 additional glass pieces to fix the window. Fortunately you already have them. Take each one out of your inventory and click above your purse to place them around the window. Once all are available, select a piece and rotate as needed to fit. You can click on the arrows or right-click to rotate the pieces. 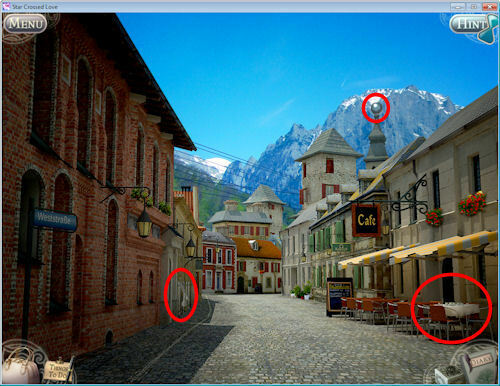 As each piece is rotated correctly, left-click on it and move it to the correct location on the window and left-click to place. If you seem to be missing a piece and you know you found all 10 pieces, click on the Go Back arrow, then click on the window again and the missing piece will show up. The scene will ripple again and you’ll be back in time at your wedding. On each of first two columns on each side are tablets. 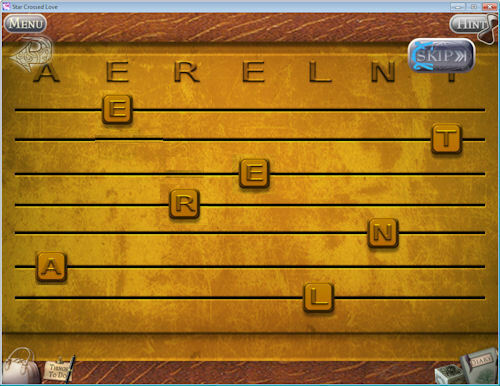 Click on the tablet marked with an arrow to start and you’ll see that the letters are jumbled. You’ll need to unscramble the words by clicking on a letter then on another letter to switch them. You can only switch letters within a word, not between words. 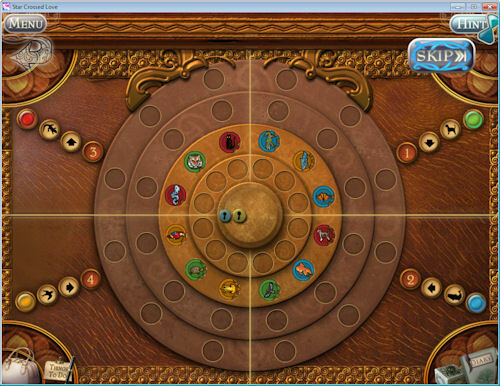 After solving all four tablets, you’ll get the time capsule with your letter and a diamond ring. At the concert hall, you’ll find that you need to collect missing parts for several instruments. Click on the stage to get a close up of it then click on the piano. 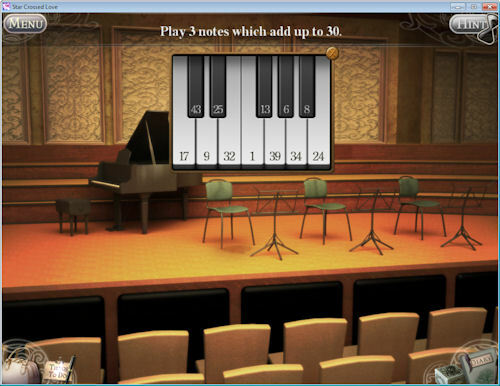 A small keyboard will come up asking you to play three notes which add up to 30. You’ll have to do this four times, then four more where you have to determine the sequence being played and play the next notes. 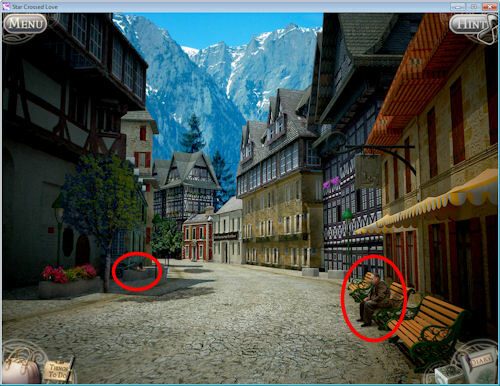 As you finish each round, pieces of the instruments will show up. At the end of round 8, the cello and violin are missing their bows and the clarinet is missing its bell. You can click on the piano stool if you want, but you’ll find that you need eight gears. Collect the gears and instrument pieces marked in red, the back out into the main hall. 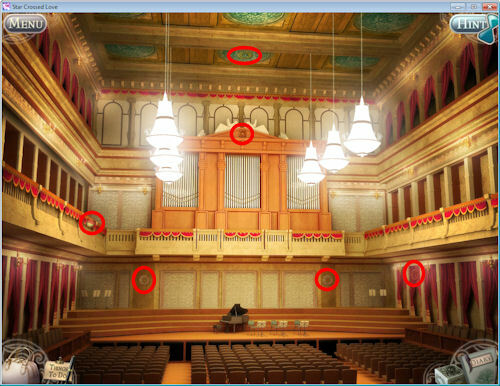 In the main hall, collect the gears and rosin marked in red. 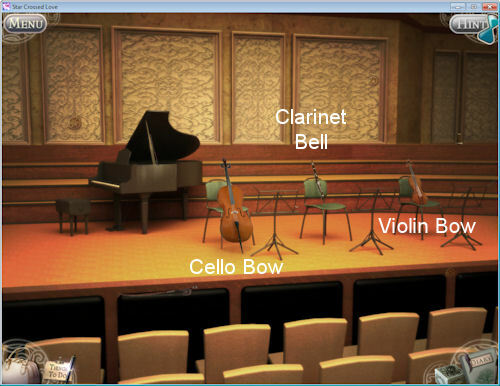 Zoom in on the stage and go ahead and place the bows and bell on the instruments, then place the rosin on the cello and violin. The stool will open to show some sheets of music. Pick up all four pieces and back out of the stool. 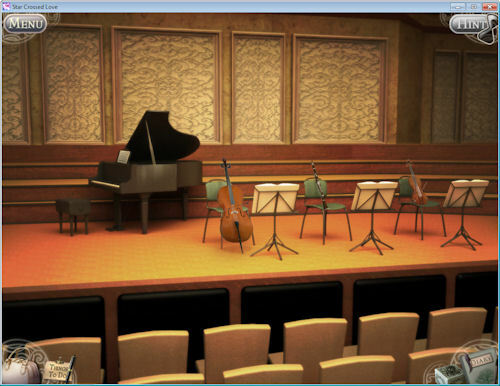 Place the music on the correct stands for each instrument and on the music holder for the piano. The scene wavers and you find an audience in front of you. 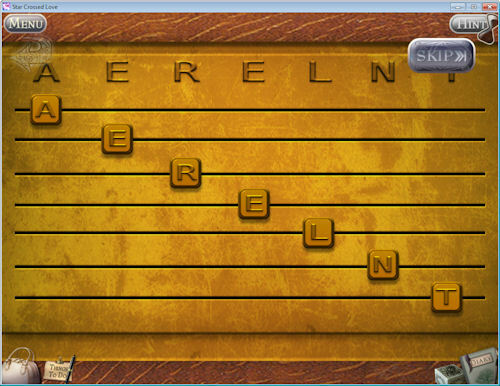 This is a match game where you click on a person and they stand up with an instrument over their head. Find the matching person and they both stand up. After all matches are made, the entire audience is giving you a standing ovation and you get your time capsule. 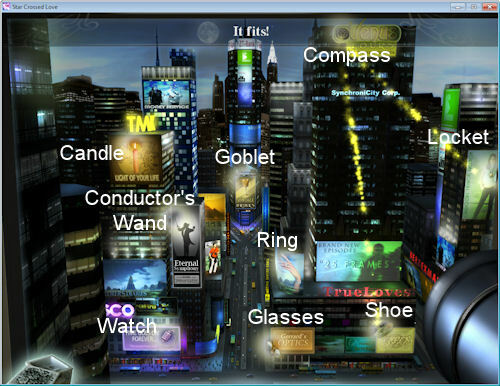 Open the time capsule to get your letter and conductors wand. In Bavaria, you’ll start out at the market. Click on the four stands in front to find out about them. There is the bronze and flower stand on the right while the clock and shell stands are on the left. Click on the fountain to go forward. You can’t do anything here but you’ll note that Aphrodite needs her shell. Click forward on the left. Collect the extension cord on the left and the crystal ball on top of the steeple. 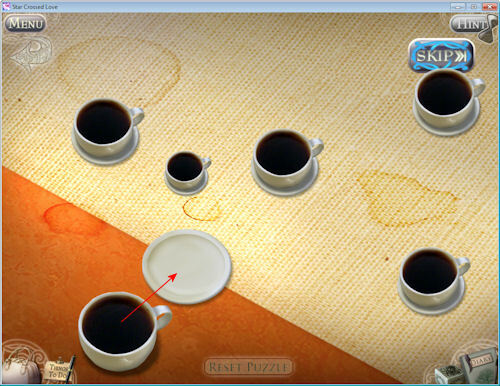 Click on the cafe and you’ll be asked to solve the coffee cup puzzle in exchange for some coffee beans. Click on the table to access the mini-game. On the table you are presented with several cups and five saucers. 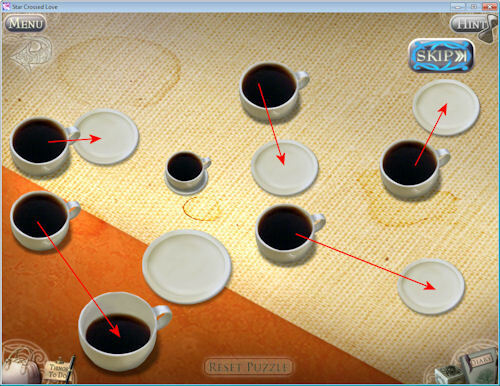 You need to fill each cup and place the remaining cups on the correct saucers. You need to make sure you end up with one large, four medium, and one small cup. As you fill each cup, the cup you filled it with will disappear. Start by filling the small cups. 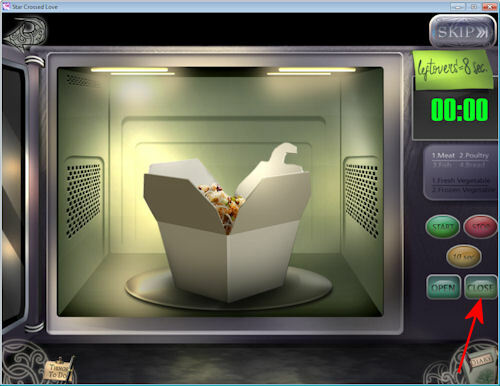 Select a cup and move it over the cup you want to fill. Use the arrows in the image below as a guide. 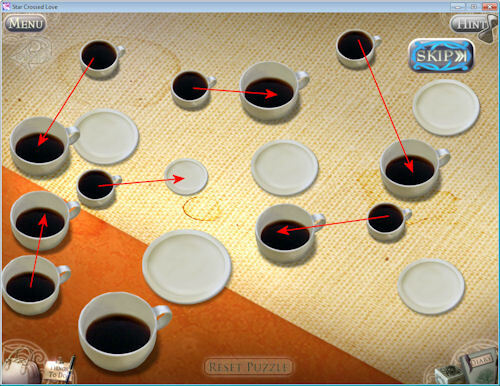 Once the small cups are filled, move one of them to the small saucer, then use the remaining small cups to fill the medium cups. 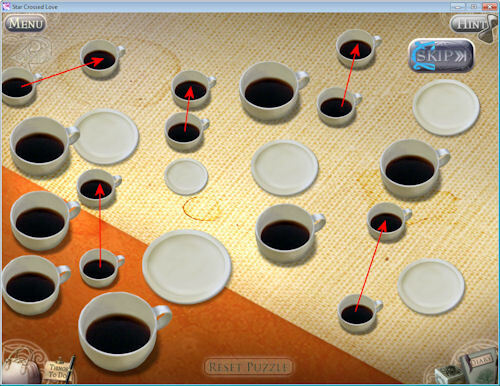 Move four of the medium cups to their saucers, then use the last medium cup to fill the large cup. Move the large cup to its saucer and you’re done! You’ll receive a bag of coffee beans in exchange. 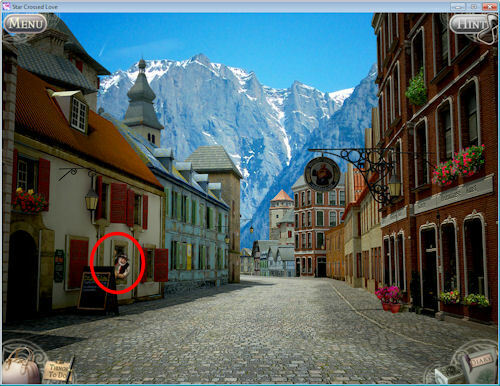 Go forward to the end of the street and click on the man hanging out the bar window. He tells you that if you buy him a drink he’ll tell you a great secret, only one silver coin required. You don’t have a silver coin yet, so continue on down the street. 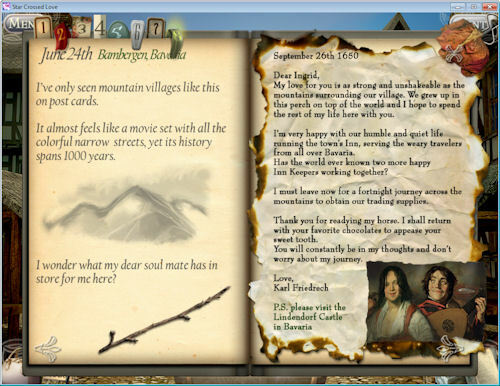 Click on the inn and you’ll be welcomed to the finest inn in the Bavarian Mountains, and oh she has a sweet tooth today! Click under the arch of the tower on the right to go forward. You can’t do anything here but remember that the gallery is here then click on the bottom of the screen to continue down the street. Click on the bench on the left to get a dirty bowl. Click on the man on the bench to find out that he’s had a lot of bad luck lately. Click on the bottom of the screen to continue down the street. Click on the chocolate shop only to be told that you can’t afford their fine fare. 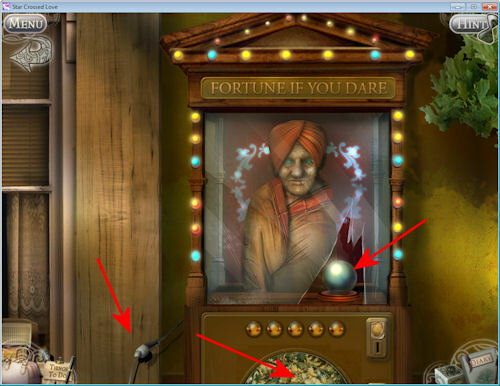 Click on the fortune tellers machine at the lower right. You’ll find that it needs power and some missing pieces, so you’ll need to find an extension cord, a coin, and a crystal ball. We already have the cord and crystal ball so we just need the gold coin. 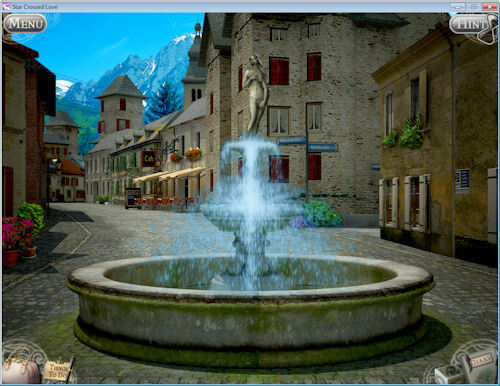 Back out of the machine and click on the bottom of the screen to get to the fountain. Place the dirty bowl in the fountain to clean it. 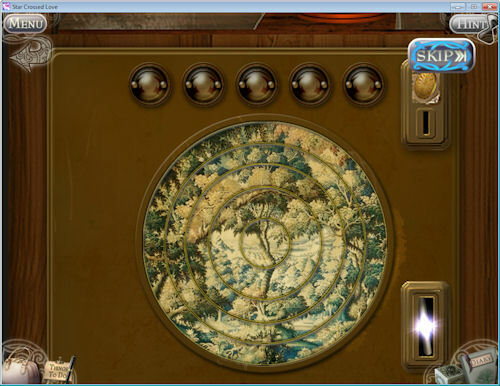 Click on the bottom of the screen and place the bowl on the Bronze stand. He’ll give you a silver coin in exchange. Just what you need to buy that fella a drink! Go forward until you get to the bar and give the man in the window the silver coin. He tells you that there is a lady that lives across from the gallery that knows all the town secrets. Be by the gallery when the clock in the tower strikes eight, but you have to fix the clock first. 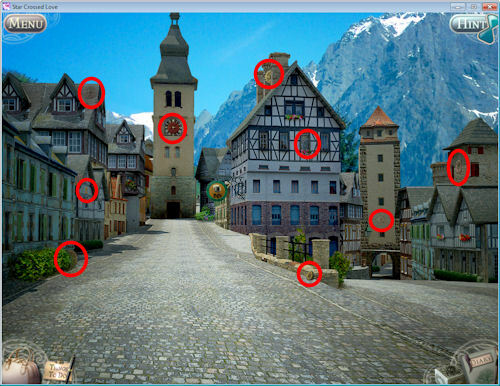 Click forward to get to the clock tower and collect the gears scattered around. 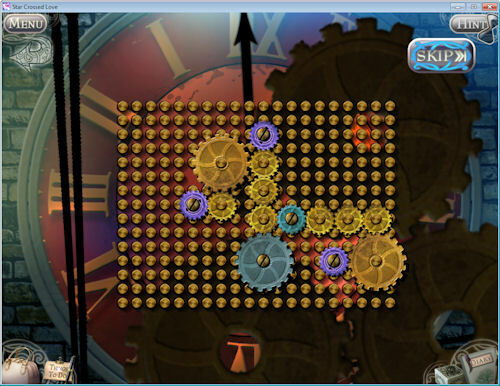 Click on the clock tower to zoom in and place the nine gears on the board. Place the gears as shown to move the gears in the right direction. 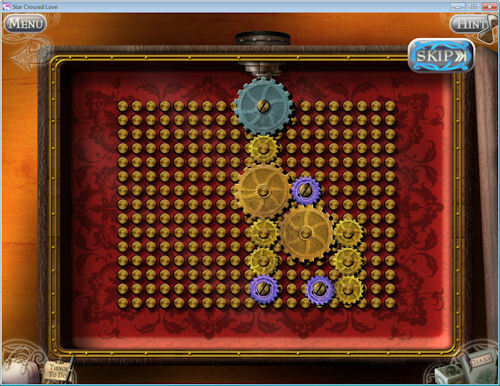 As with the piano stool, the gears with screws cannot be moved and the arrows show what direction the purple gears must rotate in. Once the clock is fixed, back out of the mini-game and click on the road on the right to go back to the gallery. You’ll start to see bells flashing over the clock tower and once it rings eight times, the old lady will open her window. If you don’t click on her before she leaves, you’ll have to wait until the bell starts ringing again. 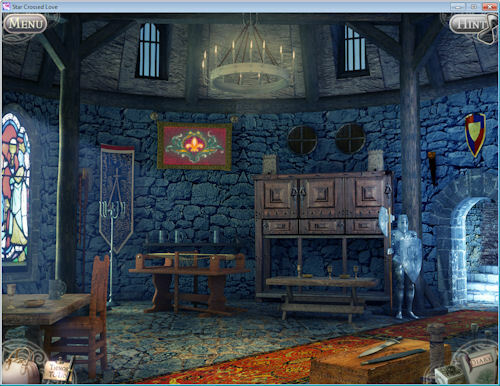 The lady will tell you that she has something that will help and tosses down an amulet which breaks into five pieces. Gather them up in order. 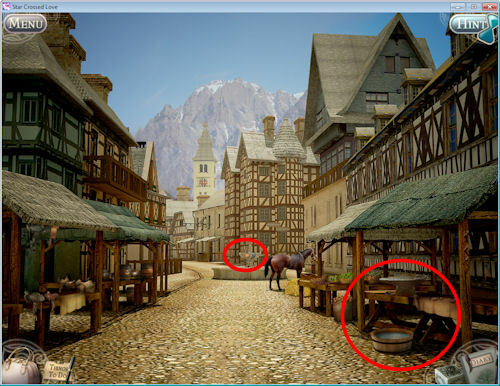 Go down until you get back to the market and place the amulet on the jewelry stand which is next to the bronze stand. She’ll give you one gold piece for it. 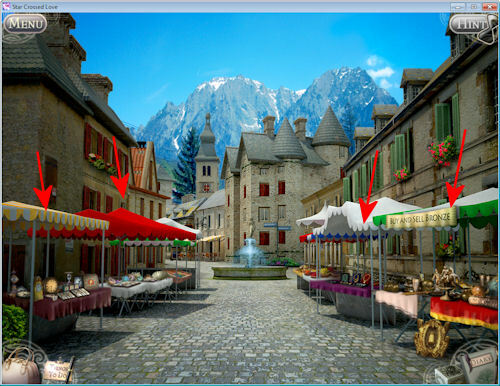 From the market, go forward to the fountain, then click on the right between the houses where you see an opening. This will take you right to the fortune teller machine. Click on the machine to zoom in. Place the extension cord on the socket and crystal ball on the base in the case. 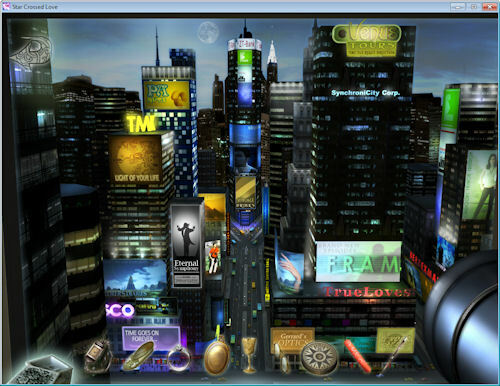 Click on the game at the bottom of the machine. 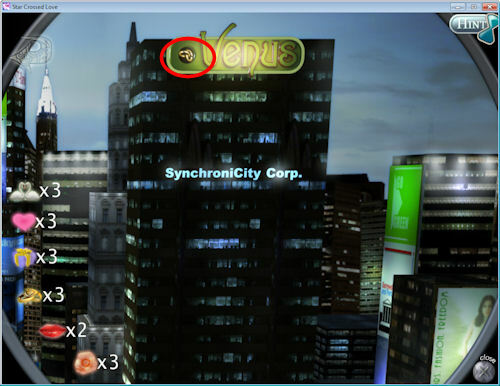 Place the gold coin in the money slot to activate the game. You have to line up the rings to form a picture using the five buttons at the top. The first button rotates the outer ring, the second button rotates the next ring and so forth down to the center sphere. Start by rotating the center piece so that the horizon is as straight as possible, then rotate the remaining rings to match. Take your fortune and read it, then click on it to collect it. 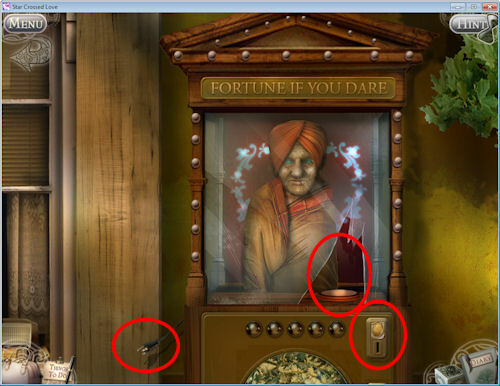 Back out of the mini-game and the fortune teller machine. Go forward and you’ll see the sad man still sitting on the bench. Give him the fortune. In exchange, he’ll give you a rose and tell you to give it to the chocolatier since he’s a bit stingy but a flower might soften him up. 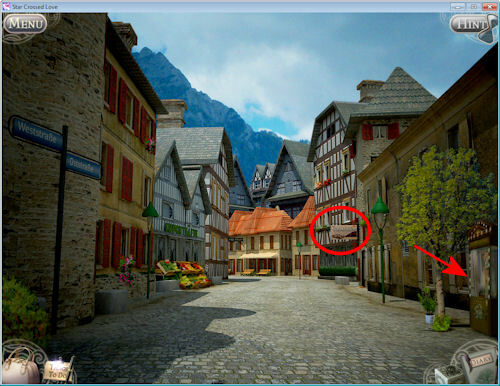 Click down to the chocolate store and place the flower on the chocolate shop. Since you are short on cash, he offers you chocolates in exchange for coffee beans … which you just happen to have already. Give them to him and receive the chocolates. Go forward three times and give the chocolates to the inn keeper. She’ll give you a pocket watch in exchange. Go down until you reach the market and give the watch to the clock vendor. He gives you a bill note in exchange. Give the note to the shell vendor and you’ll get a nice oversized shell in exchange. Go forward to the fountain and give the shell to Aphrodite. The scene will ripple and you’ll find yourself in the past. Click on the shops to see what they do or will trade for. 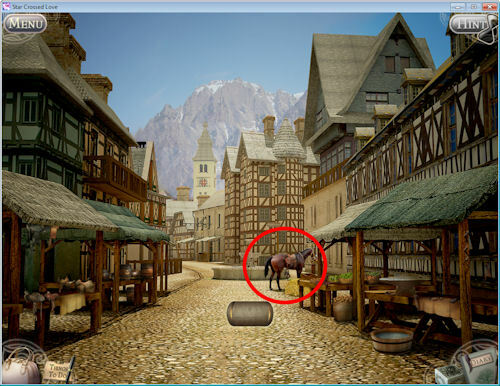 Click on the horse to find out he’s not ready for travel yet. Collect the hammer, graspers, basket, stirrups, and four horseshoes marked in red. Select the basket and give it to the food vendor. You’ll get some potatoes in exchange. Give the potatoes to the beer vendor and he’ll thank you as he was getting hungry. He offers to fill up a goblet for you. Give him the goblet from inventory and get back a full goblet. Click on the saddle stand and make an offer. Offer silver three times, then gold and silver, then gold, silver, and beer. You’ll finally get your saddle. Place one of the horseshoes on the blacksmith’s anvil, then hit it with the hammer. When it glows, pick it up with the graspers and place it in the water to cool. Take the shiny horseshoe out of the water. Repeat for the remaining three horseshoes. Place the horseshoes, saddle, and stirrups on the horse to get your time capsule. Open the time capsule to get your letter and a goblet. You’ll now find yourself at Lindendorf Castle. There is no bridge and the catapult needs to be repaired. Collect the two catapult pieces marked in red, then go down to the field. In the field, collect the catapult pieces marked in red, then return to the castle. The catapult is now done but we need some ammunition. Go back to the field. 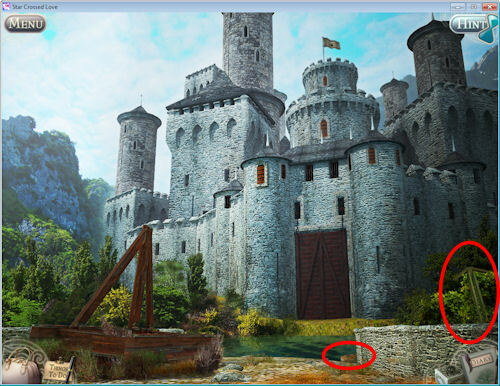 Grab the knife and round stone marked in red then go back to the castle. Place the stone on the catapult then cut the rope with the knife. 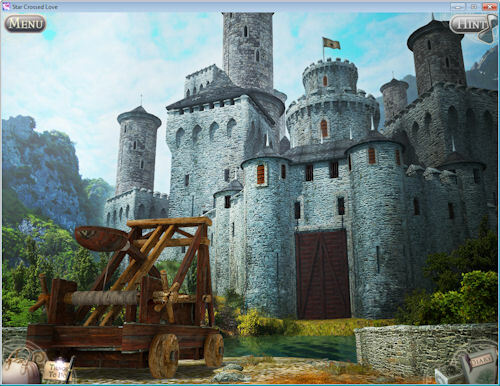 A hole will be blasted into the castle, but now you need a way to get there. The moat is too deep to cross and you need something to climb up the tower. Go back to the field. Collect the axe in the back then chop the tree trunks marked. Click on both trees twice. Gather up the wood and the vine rope up in the tree. Go back to the castle. The sticks and vine rope have been combined to make a raft. Place it in the moat then go across to the entrance. Collect the bow and arrow marked in red then go back over the moat. Grab the used rope from the catapult and it will be combined with the bow and arrow. Take the bow and arrow and click on the window. 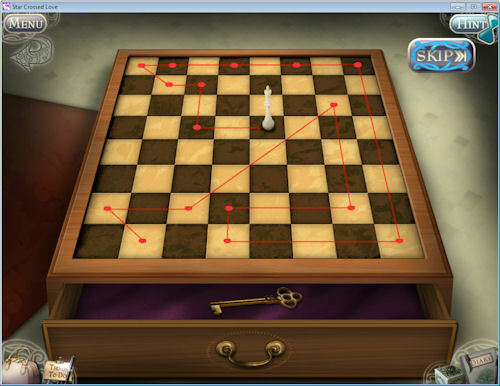 A targeting box will come up with a bouncing cross hair. You need to line up the cross hairs on the window opening. To line it up vertically, wait until it is at the window and click on the left Lock button. Repeat with the right Lock button to line it up horizontally. I found that it was easier for me to line it up horizontally first. When you get it right, the arrow shoots up into the window and the rope is hanging down ready to be climbed. 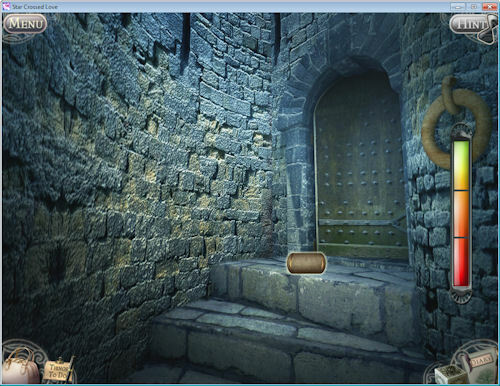 Cross the moat and click on the rope to enter the tower. 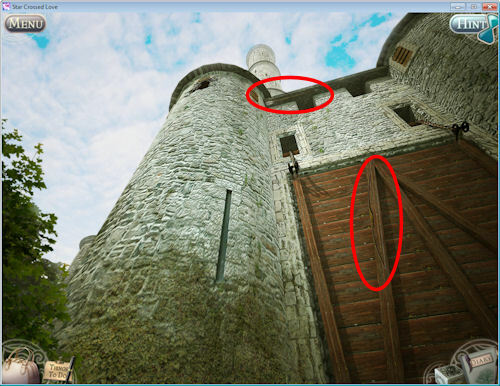 In the tower, you need to repair the quilt on the wall. Collect the four butterfly nets then head out to the field. In the field, take out one of the nets and catch all the butterflies of the same color. If you’re lucky, you can catch two or three at the same time. Once all the nets are full, head back to the tower. 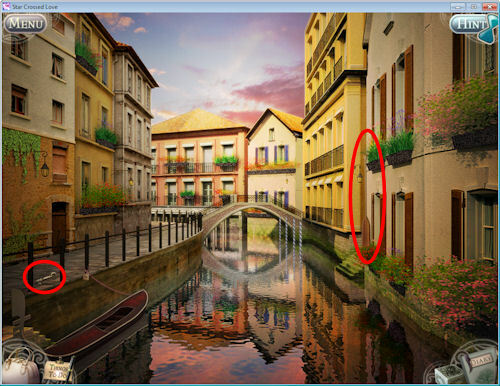 You can do this next part in any order, but I did it in the same order the threads are shown on the wall. Select one of the nets and place it on the jar under the matching color thread. The butterflies will fly up, grab the thread and embroider that color on the quilt. Repeat for the other three colors. Once the quilt is done, you’ll be transported to the past. Click on the guard and he says that you can’t pass until you hit his shield with the royal sword. 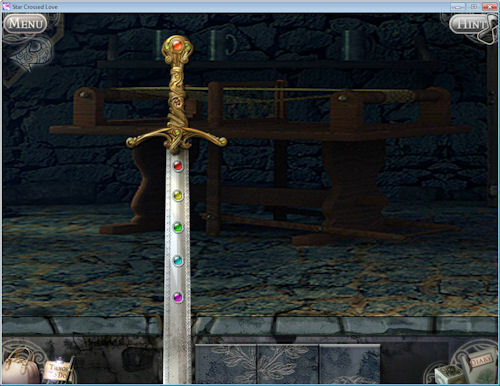 If you click on the sword, you’ll find that it is missing five gems. Collect the five gems marked in red then click on the sword. Place the gems back in the sword in their correct location. It will tell you which opening is for what gem. 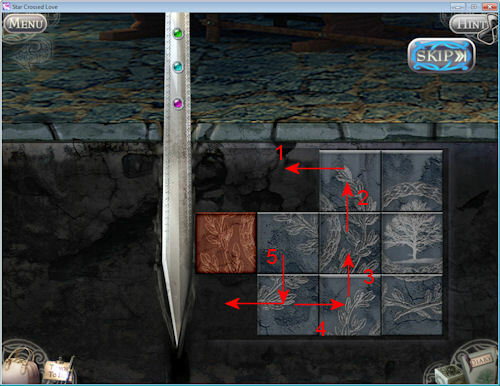 When the gems are back in place, the tiles next to the sword will move up. 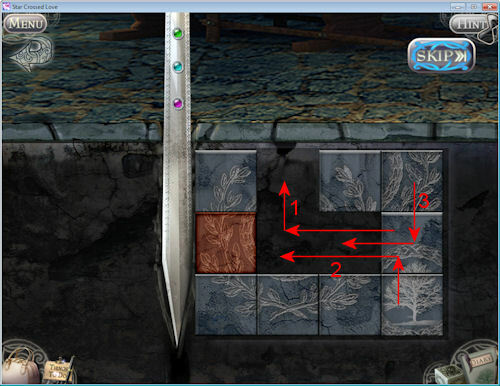 Follow the arrows and numbers in the following images to complete the tile. The brown tile can’t be moved. Once the sword is freed, take it and hit the guard’s shield with it. He’ll move aside and the door will open. This next part is annoying and not just because of the pounding music. A picture will show up at the top of the stairs then move to the middle, and finally to the bottom. As it moves, you have to determine if it is a weapon, an animal, or food and click on the Accept button if the picture matches the caption. As you go through the game, the meter on the right fills up for each correct answer. If you answer wrong, you’ll lose some of your meter but not all and can continue. It does speed up as you go. Once the meter fills up, the time capsule will appear. Click on the capsule to get your letter and a shoe. In Venice, you’re confronted with a set of pink and blue hearts. 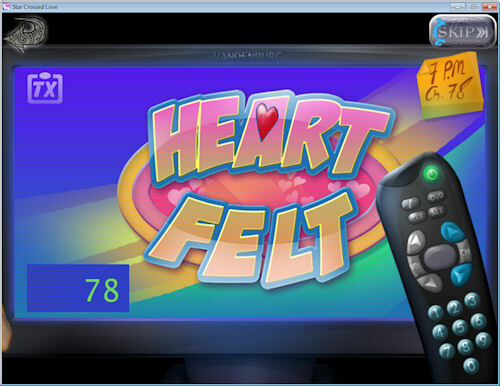 You have to match each pink heart with a blue one where at least two of the items match up. Click on a pink heart then click on the matching blue heart. The arrows show the last two that match. 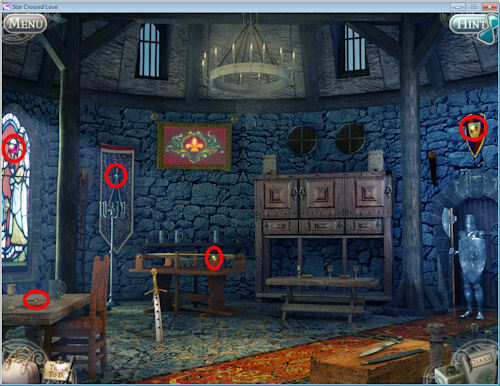 Once the hearts are gone, collect the key and oar marked in red. 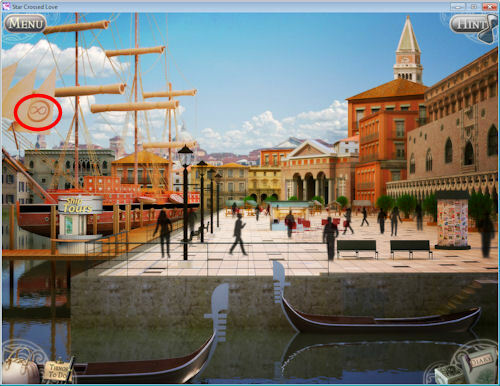 Click on the gondola to zoom in and unlock the padlock with the key. 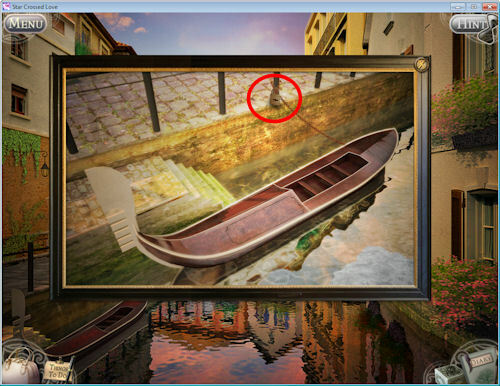 Place the oar on the gondola then close the screen. Click on the water under the bridge to travel. You’ll end up at the wharf. 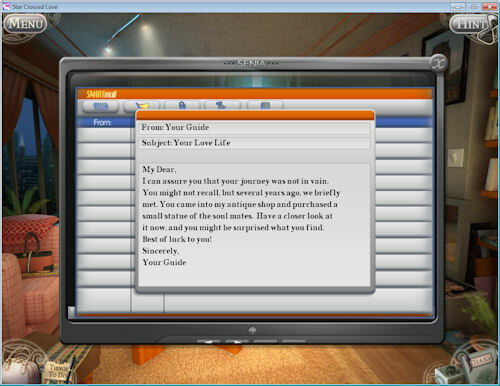 Click on the message kiosk marked in red. 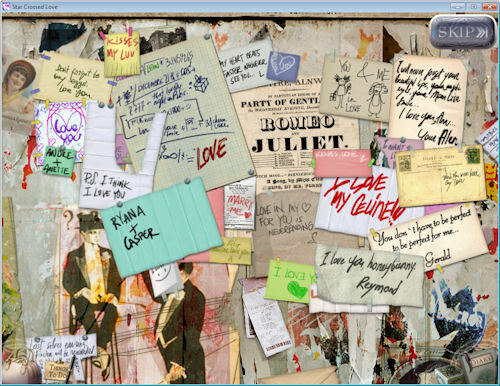 You’ll find quite a few love notes and you’ll need to rearrange them by clicking on them to place them over or under another note until all the notes can be read. Once they are all in place, a yellow note shows up with an infinity symbol on it. Click on it to collect it then back out of the kiosk. 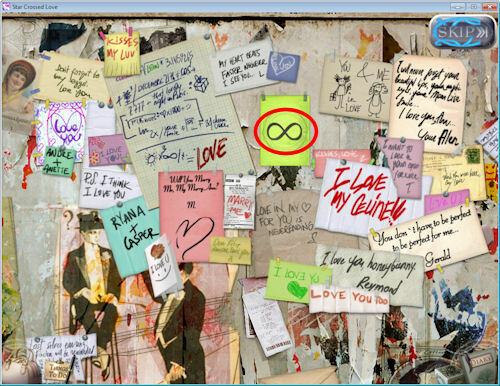 Place the infinity sign on the ship’s sail to remember that it was your love’s ship. The scene will warp and you’ll be transported back to the past. Collect the two keys marked in red then click on the chest. 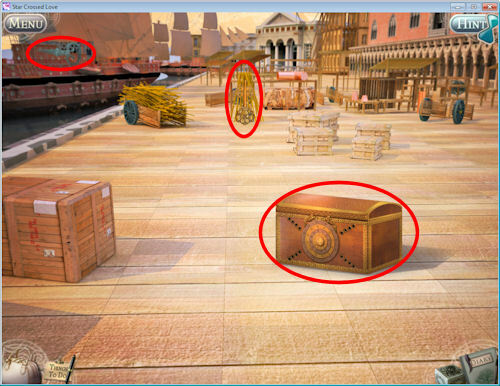 Collect the two keys here then click on the chest again to zoom in. 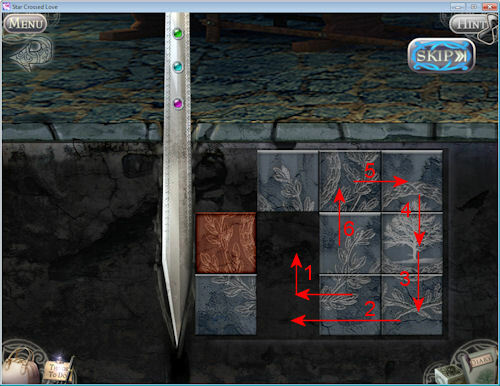 For this mini-game, you need to match up the inside moveable tiles based on the outer non-moveable buttons. For my game, the first ring is for color, second ring is for animals, third rings is for direction, and the fourth ring is for notches. 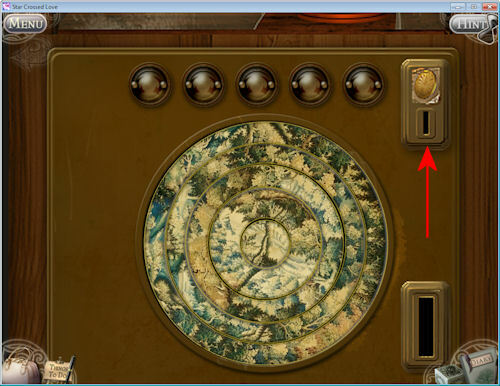 Order is not important and your button order may be different but the tiles and key for that button are the same. For the first ring, I placed the tiles with the matching colors to the button then inserted the black key. For the next ring, I placed the animals based on how they matched up with the buttons. For example, reptiles, mammals, sea/water, and flight, then inserted the red key. 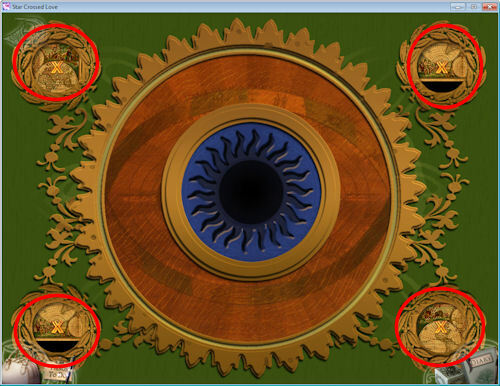 For the third ring, I placed the tiles based on what direction the creature on the tile was facing then inserted the yellow key. 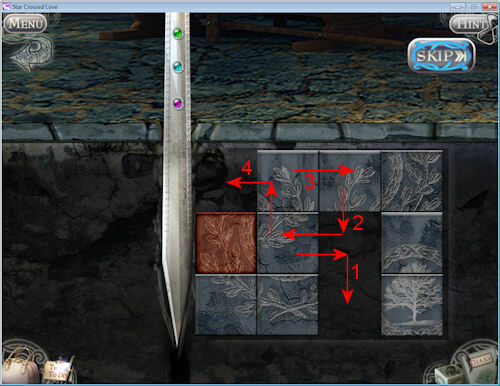 For the last ring, I placed the tiles based on how many notches were on the tiles then inserted the blue key. 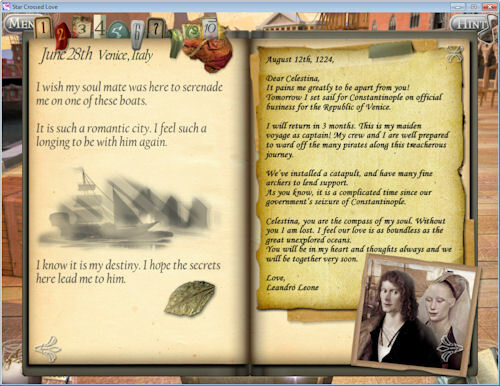 The chest opened and there was the time capsule with your letter and a compass. The last letter didn’t give a new destination so you head home to New York. When you get to your apartment, you have a new e-mail. The statue base will open up to show another time capsule. Open the capsule to get your final letter and a candle. You now have all your keepsafe items. 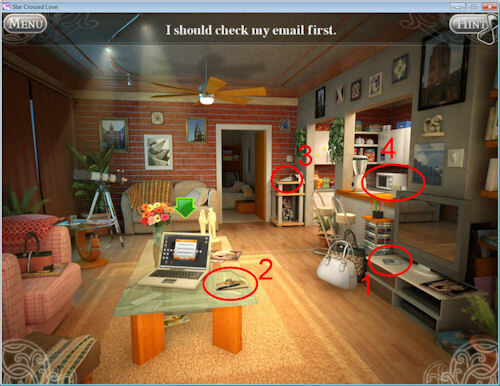 Click on the window and note that some things are missing. 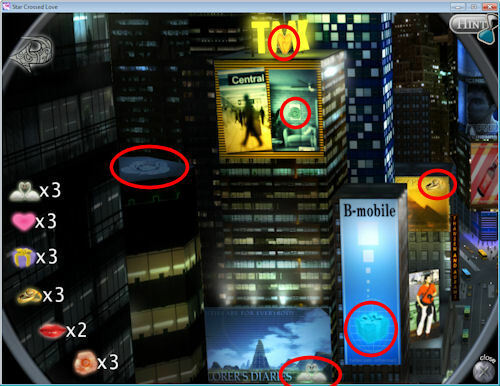 You need to place the items on the matching billboards outside. 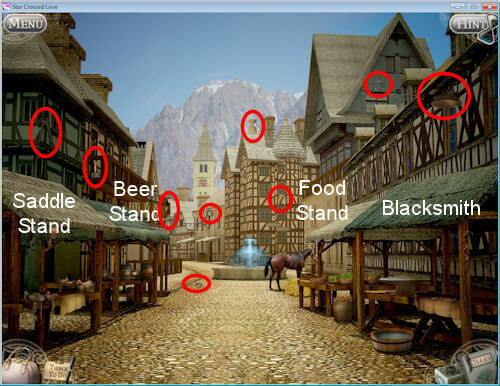 The locations for the items are shown below. 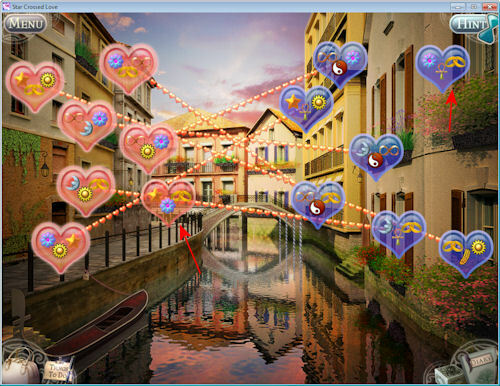 Once you’ve finished, the items will be connected and hearts will show up where your true love is. Go to him.